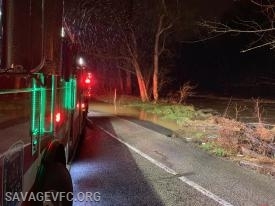 On February 14th at approximately 2200 hours, Truck 6 was alerted to respond to the 1900 Block of Fields Rd in Anne Arundel County Company 29's area. Truck 6 arrived as the second due ladder truck. Truck 6, along with other first-in crews, encountered fire on the third floor of a three story home. Truck 6 cleared the incident around 0100 hours. This is a replica of Savage Volunteer Fire Company's Ladder Truck down to the finest detail.